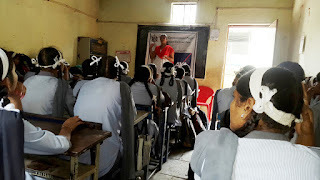 Chinchwad (Pune), 11-September-2017: The Don Bosco Development Society (DBDS), Chinchwad organized an interactive session on ‘Sexual And Reproductive Health’ for the adolescent girls in the Jay Bhavani High School at Phule Nagar slum. 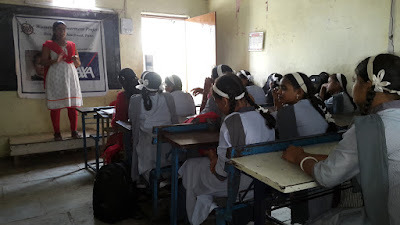 The workshop was held under the aegis of ‘Women Empowerment Project’ supported by AXA Business Services Ltd.
37 girls participated in this workshop. 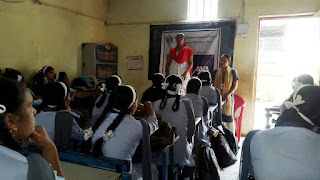 Mrs Lalita Choudhary (DBDS - Coordinator) was the resource person and Mr Vrushali Unhale (DBDS - staff) organized this workshop in association with Jay Bhavani High School. The objective of the workshop was to educate adolescent girls on Personal health, Hygiene and sanitation, menstrual cycle and Diet and Nutrition. 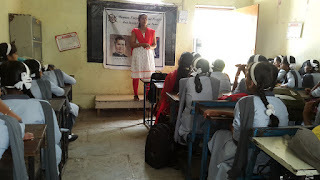 The resource person spoke about physical changes, social and psychological changes, vulnerability to reproductive health risks, reproductive health rights, contraceptives, sexually transmitted diseases, sexual abuse, HIV/AIDS and drug and substance abuse. This was followed by a question and answer session in which the participants asked questions which were answered by the resource person.